At Capital Mind we often do off-beat analysis of the markets. One of the things we do often, perhaps not often enough, is the concept of inflation adjusted returns. If you invested in the Nifty and it went up 10%, but inflation was 10% too, what would your “real return” be? Answer: zero. You haven’t increased your purchasing power one little bit. That means your inflation adjusted return is zero. But in this we have to understand nuances. 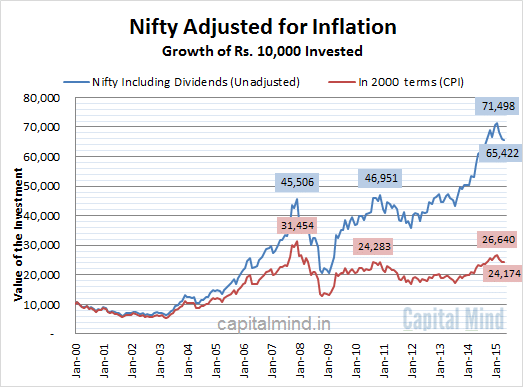 When you invest in the Nifty, you don’t realize that you actually get dividends as well. These add to your return, and can be significant. 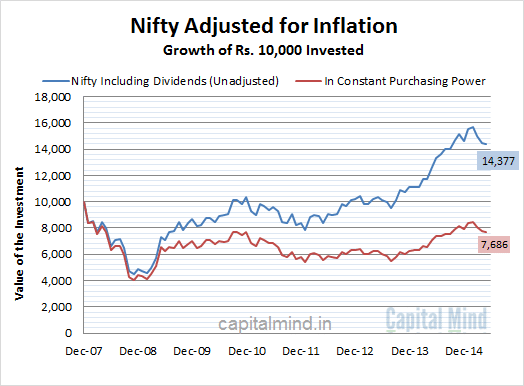 Therefore we have to consider another adjustment for dividends as well, and to keep things simple, let’s just assume that dividends are reinvested into the Nifty. There is data for this, from the NSE, called the “Total Returns Index”. Using that, we can calculate long term inflation adjusted, dividend reinvested returns of the Nifty. Which means, if you had Rs. 100 in 2000 and invested it in the Nifty, how much would it have grown to, and how much could it buy now in terms of the purchasing power of year 2000? Answer: 2.4 times more, but the graph will surprise you. In “nominal” terms, the Nifty investment has moved from Rs. 10,000 to Rs. 65,422 – a 6.5x gain in 15 years. In “real” terms, the Nifty has moved up from 10,000 to Rs. 24,326. This is a good return, but here’s the catch: It’s still lower than the number we saw in 2008! That means, the recent rise in the Nifty hasn’t even kept pace with the rise in purchasing power in the last 7 years. In fact, you put Rs. 10,000 on Jan 01, 2008 into the Nifty, the real return is horrible – you will only have a purchasing power of Rs. 7,600 today. The Nifty needs to rise a lot for it to reach a new “purchasing power” high. No wonder it doesn’t feel like the heady times of 2007-08 – we are still recovering from that time, and we are now at the highs we were in 2010.